The 2019 ESM-EVBO (European Society for Microcirculation – European Vascular Biology Organization) Conference will be held on April 15-18 and hosted at the MECC in Maastricht, The Netherlands. Prof. Ito Puruhito, a distinguished thoracic vascular surgeon at Airlangga University, in Surabaya, Indonesia has been conducting several successful human clinical studies with D’OXYVA at the university over the past few years, and he is presenting some of his latest clinical evidence on diabetic foot ulcer treatment with D’OXYVA on April 17, 2019: http://esm-evbo2019.org/program/lunch-symposium/. The European Society for Microcirculation was founded in Hamburg in 1960 following a first meeting of interested scientists in Lund, Sweden in 1959, and now has 500-600 regular members. The aims of the Society are to advance understanding of the microcirculation by bringing together clinicians and scientists from a wide range of specialists, but including physiology, vascular biology, genetics and biophysics. Since 1980, the Society has its own journal, the Journal of Vascular Research, an international publication of growing impact, through which the world wide scientific community is informed of the Society’s endeavors. EVBO was launched in 2006, after discussion between European vascular biologists who recognized that there is a need for a democratic society to provide a united focus and forum for vascular biologists in Europe, primarily by organizing conferences but also by maintaining and enhancing an interactive network of researchers; evolving from the experience of the previous European Vascular Biology Association and building on the achievements of the FP6 European Vascular Genomics Network (EVGN). Circularity Healthcare, LLC, headquartered in Los Angeles, California in the U.S., is an emerging world leader in proprietary circulatory health and noninvasive delivery technologies, committed to helping significantly improve lives by developing, manufacturing, and marketing medical, pharmaceutical, and consumer health products. Circularity specializes in groundbreaking noninvasive technologies for affordable and portable transdermal delivery systems, and is pursuing regulatory approvals worldwide for device usage as a treatment of disease states related to cardiovascular and microcirculatory blood flow, immunological and autonomic nervous system disorders. According to the American Diabetes Association, millions of people around the world live with diabetes or know someone living with diabetes. No type of diabetes is curable yet; however, it is a very treatable disease, and no matter how frightening, annoying, and frustrating it can be, people with diabetes can live long, healthy, and happy lives. Our goal is to provide you the information, tools, and resources to help make that happen. In a recent statistics report from CDC National Diabetes Statistics, diabetes remains the 7th leading cause of death in the United States in 2015, with 79,535 death certificates listing it as the underlying cause of death and a total of 252,806 death certificates listing diabetes as an underlying or contributing cause of death. With numerous methods on the market for managing and treating diabetes, there is one product that is a cut above the others when it comes to diabetes care–D’OXYVA by Circularity Healthcare. Setting a new paradigm in health science, D’OXYVA is a truly unique technology at its core, a first-of-its-kind biotech solution clinically validated to significantly lower the risk of diabetes and cardiovascular complications. Circularity Healthcare was recently selected for the list of “Top 10 Diabetes Care Solution Providers of 2018” in the upcoming November Diabetes Care special edition of MedTech Outlook magazine after receiving more than 270 unique nominations from more than 39,000 qualified print and 66,000 qualified digital subscribers. The magazine does not rank the top ten providers; it lists them in alphabetical order on a full page. In addition, the magazine will run a featured article on Circularity and its D’OXYVA product line in the same special edition this November. The future holds favorable prospects for Circularity Healthcare. They are expecting continued commercial growth with D’OXYVA, with other major announcements to follow shortly in multiple leading media outlets in the US and around the world as Circularity’s global marketing and PR campaign based on years of yet-unpublished highly successful clinical evidence unfolds in the coming weeks and months. At the end of it all, D’OXYVA is indeed a revolutionary and a much-needed step toward a powerful and safe diabetes care solution that is adding immeasurable value to health outcomes. The Philippine Wound Care Society is a non profit, non stock, SEC registered organization. It was founded on September 09, 2009 with the purpose of improving the wound management in the Philippines through education. The society which is composed of physicians from different specialty groups and allied services (wound care nurse, physical therapy) brings together professionals involved in wound care. The organization held its 1st regional meeting last February 26-27, 2015 at Cebu City Philippines. InvisiDerm’s CEO, Norbert Kiss and Senior Sales and Marketing Manager, Jennifer Rose Boadilla were invited by the President of the organization, Dr. Martin Anthony A. Villa and got the chance to meet some of the most influential cardiovascular and wound care KOLs at the said event. The event was professional and had overwhelming participation exceeding the initially registered numbers. The speakers and their presentations were high quality and informative showcasing the latest in technologies and approaches to wound management. We are glad to announce that InvisiDerm has secured some of the most influential cardiovascular and wound care KOLs from Taiwan, Singapore, Japan, Korea, Philippines and a few other countries via strategic relationships at this Philippine Wound Care Society Regional Meeting. In addition, a protocol for a comprehensive multicenter study coupled with diagnostics for diabetic foot wound healing on hundreds of subjects at leading hospitals, and an academic level study into the biochemical properties of D’OXYVA in wound healing, and a study for erectile dysfunction in diabetics was finalized, agreed and initiated with several KOLs based on the successful pilot study conducted by Dr. Harikrishna R. Nair at Hospital Kuala Lumpur, Malaysia. The quality of life benefits for patients such as significantly improved sleeping, eating, mood and pain makes D’OXYVA a distinct winner besides being noninvasive and fast without negative side effects. Furthermore, InvisiDerm has met regional directors of several leading wound care products multinationals and their distributors for in-depth private discussions about business models and development challenges across Asia. Circularity is clearly a leader in a number of aspects if not most. Special thanks to the team at Getz Bros. Philippines for their warm hospitality. By virtue of the fact that Institutional Review Boards (IRBs) approved human clinical studies with D’OXYVA® and concluded that it was a Non-Significant Risk (NSR) device, D’OXYVA® has an approved Investigational Device Exemption (IDE). See 21 CFR 812 reference below in section (b) and (1) highlighted in CAPITAL LETTERS. This means D’OXYVA can be used for any medical purposes under testing (investigations). Doctors can ask their patients if they would like to try and test D’OXYVA® for a certain period of time to see if it helps their condition. First, D’OXYVA should be used as an adjunct application combined with other therapies (no negative interference with other modalities has been reported to date). Typically, patients should test D’OXYVA® for the first time for 6-8 weeks twice a day for the first two weeks and then once a day to achieve best results according to various clinical trial results and user feedback with D’OXYVA® . Severe cases should continue using it twice a day for 4 weeks and then based on progress lower dosing to once a day. (iii) Ensures that each investigator participating in an investigation of the device obtains from each subject under the investigator’s care, informed consent under part 50 and documents it, unless documentation is waived by an IRB under 56.109(c). (vii) Complies with the prohibitions in 812.7 against promotion and other practices. Circularity Healthcare announced today that it has received CE marking for its D’OXYVA transdermal medical gas delivery device and has begun shipping the latest version of the CE-marked product to customers in the European Union. The company also announced that it has recently begun a multi-center randomized clinical trial for diabetic foot ulcers, which is one of the primary applications initially being targeted by D’OXYVA. Circularity is also in the process of filing for clearance of D’OXYVA with the Food and Drug Administration in the United States. Circularity Healthcare, LLC, headquartered in Los Angeles, CA with subsidiary offices in Kuala Lumpur, Malaysia and London, United Kingdom is a multinational biotech leader in noninvasive circulatory health applications. In today’s announcement, the company stated that its most advanced D’OXYVA product line is now available as a Class I, low risk Noninvasive Transdermal Delivery (NTD) medical device. D’OXYVA (deoxyhemoglobin vasodilator) is the worlds most used, most studied, most affordable, and lowest risk non-invasive medical gas-powered transdermal delivery device. The simple to use handheld device is intended for significant improvements in tissue microcirculation with cellular oxygenation via the well-known Bohr & Haldane effect. D’OXYVA is being recognized in a rapidly growing number of published randomized clinical trials, yielding impressive results in producing a variety of significant health outcomes that is targeting to combat the underlying cause of some of the most widespread chronic illnesses across a range of fields. D’OXYVA has a track record of hundreds of thousands of successful applications, as validated and reproduced by prestigious institutions and researchers around the world since 2011. D’OXYVA is a one-of-a-kind health product, as we are not currently aware of any devices producing similar benefits. Our recently acquired CE mark, coupled with our use of approved medical gases and our registration to ISO13485:2012 in the EU and ISO13485:2003 in Canada, further establishes Circularity as a leader in both the microcirculation and transdermal drug delivery space, said Circularity Healthcare Chief Executive Officer, Norbert Kiss. Our strategy of obtaining the CE mark based on a claim to deliver already-approved medical gases like Carbon Dioxide (UN1013) allows us to make D’OXYVA available for sale much sooner around the world, since such low risk devices utilizing previously approved non-toxic active pharmaceutical ingredients typically obtain registration by local regulatory agencies much more quickly than devices posing more risk to the user, Mr. Kiss added. During the process of working with the EU Notified Body, Circularity had compiled a Clinical Evaluation Report (CER) to demonstrate accuracy, reproducibility, and other key performance indicators. The results demonstrated a success ratio of all enrolled human subjects of about 97% and unmatched sustained beneficial effects. The results described in our CER were fantastic on all of the key performance metrics, said Dr. Paul Kirkitelos, Chief Business Development Officer at Circularity Healthcare. European regulatory registration for D’OXYVA is a significant validation of our unique method of rapidly delivering gas molecules noninvasively via the skin into microcirculation, and these results clearly demonstrate the superiority of our targeted approach to treating the underlying cause of many of the most widespread chronic illnesses like diabetic and venous foot ulcers, hypertension, and types of cancer like multiple myeloma, Dr. Kirkitelos added. Among the early adopters of D’OXYVA Dr. Damian Kelleher at Pennine Hospital Trust noted, obtaining the CE mark for Circularity’s D’OXYVA is welcome news and a significant step towards enabling our hospital networks use of this new modality in the clinical setting. D’OXYVA shall allow us to reduce time, cost, and readmission rates. Additionally, Prof. Ito Puruhito of Airlangga University noted, It’s very encouraging to learn that Circularity has achieved the CE mark. As we’ve been using D’OXYVA for several months with flawless results, our university hospital staff will be glad to be introducing the CE-marked D’OXYVA system to as many patients as we can. Receipt of the CE mark greatly enhances Circularity’s ability to ramp up sales rapidly through the sales and distribution networks it has already put in place. The company has a comprehensive Early Access Program for healthcare providers under D’OXYVA Investigational Device Exemption (IDE) status. With reproducibility rates demonstrated through over 300,000 applications in over five years in multiple countries, Circularity has trained over 300 sales experts and doctors, and more than a dozen hospitals and clinics are in the process of conducting randomized multicenter human clinical trials around the world, including Florida State University, Pennine Hospital Trust, Hospital Kuala Lumpur, Airlangga University, and University of Szeged. Additionally, D’OXYVA has been used routinely at wellness and integrative alternative medicine centers since 2013, where users have reported major reductions in various chronic pains, fatigue, and weight while improving energy, cardiac functions, and overall quality of life. Several manuscripts are pending peer-reviewed journal publication that is expected to garner significant attention from the medical community worldwide and establish Circularity’s D’OXYVA as the most tested, most trusted, and most used noninvasive transdermal delivery for treating major disease states by addressing the pervasive issue of microvascular disorder. October 16-18, 2015. 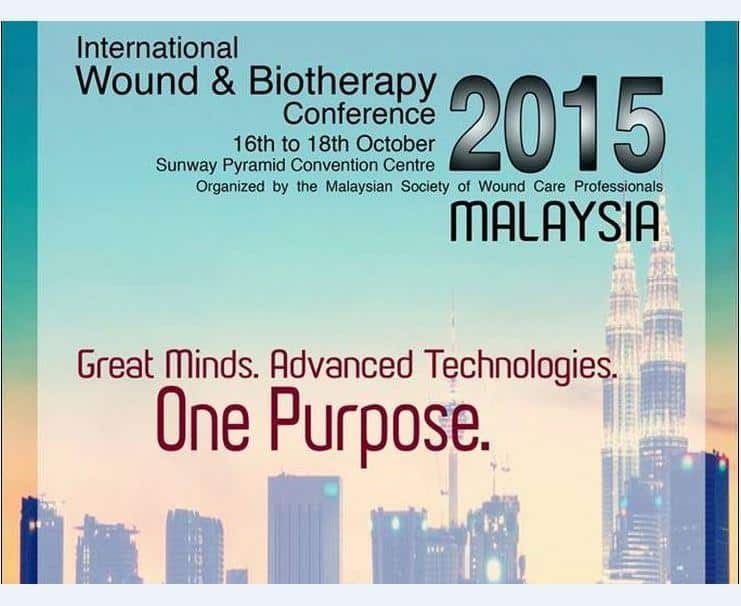 Kuala Lumpur, Malaysia – Internationally recognized authorities in the field of wound care and biotherapy came together in one single platform to have an in-depth discussion on recent scientific advances and innovations to improve the management of complex and chronic wounds. Circularity Healthcare as one of the platinum sponsors had its first successful launch of D’OXYVA® in Asia, with the aim to be the pioneer in non-invasive transdermal delivery to help optimize microcirculation for wound care, health and wellness. In the span of three days, several hundred medical experts from more than 30 countries visited our exhibition and showed interest in bringing D’OXYVA® to their countries. A lunch symposium was held with two renowned cardiovascular experts speaking about their recent findings on how the science of D’OXYVA® can lead the way for better wound care tomorrow. In the next issue, we will feature our interview with both of these experts, conducted during the conference. Stay tuned. We are as excited as you are, and we thank you for supporting our ongoing efforts to advance the study of microcirculation. SURVUE 5 2015 was organized by leading doctors from thoracic, cardiac, and vascular faculty department of Kedukteran Universitas Airlangga Surabaya, Indonesia. Their 5th conference was held to discuss vascular updates on March 6 – 8, 2015 at RSUD Dr. Seotomo Hospital. Circularity’s CEO, Norbert Kiss and Senior Sales and Marketing Manager, Jennifer Rose Boadilla were invited by Professor Puruhito, the organizer of the event and got the chance to meet some of the most influential thoracic, cardiac, vascular, and wound care experts in Indonesia at the this event. With the personal introductory presentation of D’OXYVA by Prof. Puruhito, Circularity’s CEO, Norbert Kiss delivered two presentations of 30 minutes each on two separate days to the attending doctors about the importance of measuring and improving microcirculation, the latest research in the field, and the various clinical evidence of D’OXYVA for unmatched improvements of microcirculation, related physiological functions, and their benefits in humans coupled with case studies. We are glad to announce that Circularity has secured some of the most influential thoracic, cardiovascular, and wound care medical thought-leaders from Indonesia via strategic relationships at this event. Participation in our comprehensive multicenter, multicountry study coupled with advanced diagnostics for diabetic foot wound healing on hundreds of subjects at leading hospitals is being expanded to Indonesia. Attending doctors discussed in private meetings with Circularity initiating studies and the potential significant benefits of D’OXYVA for pre-, and post-operative vascular applications, cerebrovascular disease, and ischemic heart disease, which is the most common cause of death in most western countries. Circularity’s affordable, safe, and fast applications for a wide variety of significant clinical outcomes make it clearly a leader in a number of aspects if not most based on the feedback received. With the help of PT Regenesis, we had a chance to showcase D’OXYVA’s use and debut our new catalog with an exhibit booth to participants of this event. Special thanks to PT Regenesis for their warm hospitality.